As I get older, the anthropology of the human species gets increasingly fascinating. I don’t think I’m alone in this. With every passing year, I believe that people tend – on average – to become more conscious of the bigger view. Or what I call the ‘Life, the Universe and Everything Questions’. People often seek these answers for a whole variety of different reasons. Often the journey is moulded by the mistakes that they’ve made in the past and the experience of witnessing the reality of human behaviour ‘in the wild’ (or what passes for the wild in modernity) – in other words, seeing for themselves the contrast between what humans say and what they actually do. But using this accumulated wisdom to ask more questions often leads to the realisation that, in the absence of any other factors, the past is often the best indicator of the behaviour of humans in the future. To a great extent, new trends and technologies matter little – because they are still controlled by humans who suffer from the same weaknesses and selfish behaviours, combined with tribal loyalties, that we always have. Hence the growing interest in the anthropology, or the ways in which humans behaved in societies in the past. You only need to take a look at the success of books such as ‘Sapiens’ by Yuval Noah Harari and ‘Guns, Germs and Steel’ by Jared Diamond to see the demand. 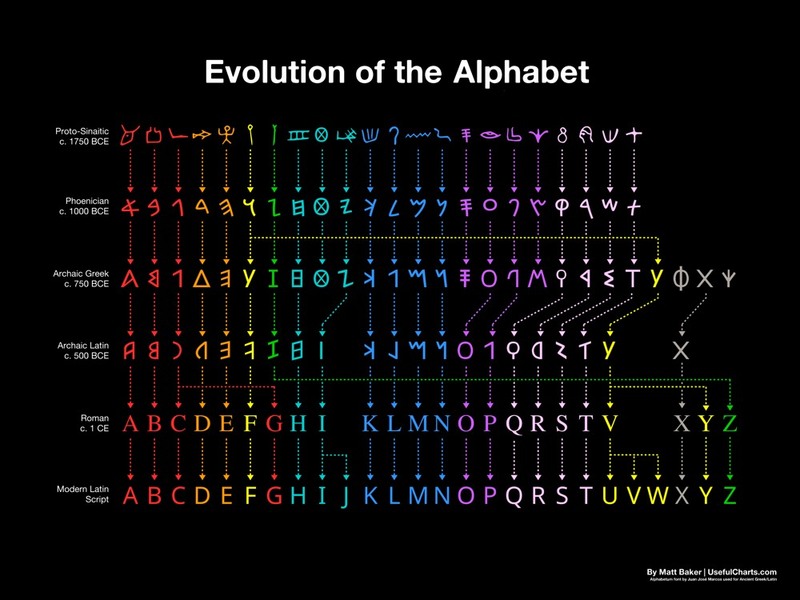 Anyway, this is a pretty cool diagram – showing the evolution of the English Alphabet of the Proto-Sinaitic (Middle Bronze Age) to the present day Modern Latin Script. I’m not sure that it really conveys any of the epic story that went into those many thousands of years of human history that built up the customs and meanings that each of those markings has come to represent over the millennia. But I’d challenge anyone to look at it and not come away with at least five big questions about the past you came from.